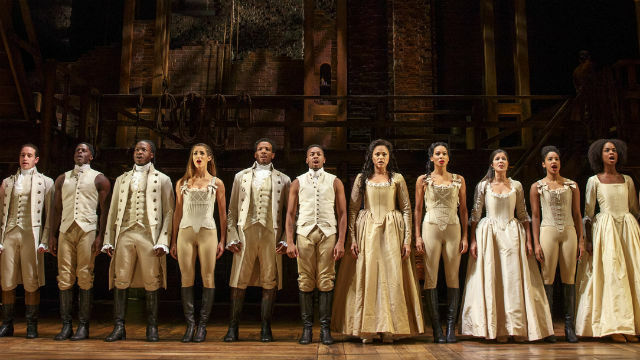 A touring production of the acclaimed Broadway musical “Hamilton” opens at the San Diego Civic Theatre Saturday afternoon. There will be 28 shows in San Diego through Jan. 28 presented by Broadway San Diego. “Hamilton” tells the story of Founding Father Alexander Hamilton, an immigrant from the West Indies who became George Washington’s right-hand-man during the Revolutionary War and was the first treasury secretary. The acclaimed score blends hip-hop, jazz, blues, rap, R&B and classic show tunes. The musical was written by Lin-Manuel Miranda and premiered on Broadway in 2015. Since then, it has had overwhelming box office success. The musical won 11 Tony Awards, including best musical, a Grammy and a Pulitzer Prize. Resale tickets are still available for Saturday’s matinee show at 2 p.m. and the show at 8 p.m. on Ticketmaster.com. The San Diego cast will include Austin Scott as Hamilton and Nicholas Christopher as Aaron Burr. Scott’s credits include “One Day” and he is currently playing John in the Broadway revival of “Miss Saigon.” He played Washington in the Broadway version of “Hamilton,” according to the show’s producer.